Everyone’s fallen victim to peer pressure at some point in their life, but German researchers have identified a uniquely modern twist on the phenomenon: children feeling subjected to peer pressure from robots. Researchers at Bielefeld University replicated the ‘Asch Paradigm’, a series of tests developed by behavioral psychologist Solomon Asch to determine how people are affected by peer pressure in a group. In the experiment, a group of subjects are shown a black line, and are given a choice of three other lines of different lengths. They’re then asked individually which of the three lines (1, 2, or 3) matches the original. Actors placed in the group are instructed to pick the wrong line, despite the correct answer being obvious, which, Asch found, led to a number of participants being influenced by peer pressure to select the wrong answer. In the new study, the actors were replaced by three robots – specifically, Softbank’s cutesy humanoid droid Nao. When the researchers compared the results of children and adults, they found that the children were far more likely than the adults to be influenced by the robots and select the incorrect answer. Although the researchers were unsure why children went along with the robots more readily than adults, the results raise questions about robotic toys aimed at kids if the toys act erroneously or are hacked. For example, could kids be encouraged to buy accessories for their new toy without parental consent? The Bielefeld University team has suggested that new regulations on robotic toys may be needed to address the issue. 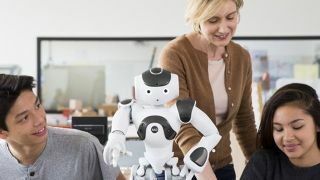 Speaking to Motherboard, lead researcher Anna-Lisa Vollmer said: “a regulatory framework for the social influence of robots, could for example, be similar to the one that is in place for advertisement”. Robotic toys are growing in popularity, from AI powered droids like Anki’s Vector to the AR-enabled Mekamon fighting bot. Wi-Fi connected toys like Mattel’s Hello Barbie have previously come under scrutiny for security issues, and this latest research is unlikely to put parents’ minds at ease.